Muhammad Ali’s Offer of a Million to “Sugar” Ray Robinson Rejected! It was after Muhammad Ali won the world title in 1964 over then champion Sonny Liston that he announced he had joined the Nation of Islam. Considered by most historians as the greatest pound for pound boxer in the history of boxing was “Sugar” Ray Robinson the former welterweight and middleweight champion. After winning the title Ali was invited to join Robinson on the island of Jamaica in 1965 as a celebrity trainer for one of Robinson’s fights. In March Robinson was fighting Philadelphia’s Jimmy Beecham in Kingston. As the story goes there were two figures mentioned. Ali either offered Robinson a million dollars or $700,000 if he would become a Muslim. The money would come from Muslims donating $1.00 each. 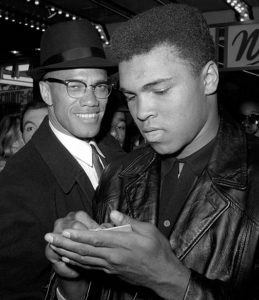 Robinson informed Ali that he could not accept such an offer being a Christian. It’s been reported recently that the FBI has made public the racist remarks Ali made against white people. One thing not mentioned is that his trainer was Italian Angelo Dundee and his cut man a white Cuban named Ferdie Pacheco. Wali Muhammad was the assistant trainer along with Bundini Brown. In December of 1990 Ali was responsible for bringing home 15 hostages from Iraq which included both black and white.